Great house, plenty of room, fine amenities, mere feet from 10 Barrel Brewing. Fantastic place for you and your friends or family to start your Central Oregon adventure. Plenty of shops and food within walking distance, only a few minutes form downtown. We will be back!!!! Had a family rendezvous for Mothers Day weekend - six adults, perfectly comfortable. This beautiful home is in the perfect location - we parked and walked everywhere...downtown, Drake Park, breweries, bakeries, restaurants! Comfortable beds; living and dining rooms comfortably seated six. Bonus private back patio. This is the place to land when visiting Bend! This home is beautiful, immaculately clean and fabulously decorated. We enjoyed the cute backyard, which is steps away from our favorite brewery, 10 Barrel. Its walking distance to downtown, the river, and countless restaurants. We were initially concerned that the house didnt have air conditioning (since we were coming in July), but the owners were super accommodating and had powerful, portable window units in the master, the bedroom with the queen bed, and the living room. The house stayed very cool and we were super comfortable and appreciative for the hospitality. We cannot wait to come back and stay in this home! It surpassed all of our expectations! I went with 3 girlfriends for a girls weekend in Bend and had the pleasure of staying at this quiet, clean, adorable home that was decorated just the way I would have decorated my own home. It has a very cozy feeling and I especially loved the lighting and the tray ceilings. It was also fully stocked with glassware, towels, built-in washer/dryer, dishwasher, in fridge ice maker filled with ice, etc. It was within walking distance to 10-Barrell and Oblivion which was basically right in our backyard. But was also an easy walk to downtown Bend and Drake Park. Would highly recommend this company and especially this home to friends/family. This Cascadia Craftsman was a wonderful house for our getaway. It was everything the pictures displayed - beautiful, close to town, well equipped, and stylishly decorated. 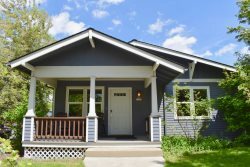 Cascadia Craftsman is a nicely finished, well-appointed bungalow and perfectly suited our needs for work and play in Bend. We were four visiting instructors at COCC for a long weekend workshop, so everyone had their own comfy bed and the 2 baths are easily shareable. We enjoyed the close-in proximity so we could walk to great restaurants after getting back from class but also enjoyed lunch breaks on the sunny deck of the house. The kitchen is well stocked, the linens and towels high quality, and the beds luxurious. Namaspa Yoga and 10 Barrel are literally right outside the back door, two gems of Bend for sure. The neighborhood is quiet despite so many local attractions, and the homes warm lighting features and gas fireplace provide a relaxing retreat. I will stay here again, perhaps get to use the complimentary city bikes next time to enjoy more Central OR fresh air. Our family of six-stayed in the Cascadia Craftsman over Christmas and we enjoyed the house and location. The design of the house lends itself to families-grandsons loved the twin beds in the middle bedroom. The bathrooms were well appointed and the house is spacious thanks to ingenious design while being a Craftsman bungalow. We had extended family over for Christmas Eve and there was ample space in the kitchen for food prep and serving. The design of the galley kitchen feels spacious with arched ceilings and the back door to the deck and hot tub. Our family enjoys walking around Bend and we enjoyed walking to Newport Market, Nancys Pies, the Columbia Park and walking bridge to downtown,; the proximity to 10 Barrel right through the back gate was a bonus. The location, for being near shopping and entertainment, was quiet. I believe neighborhood establishments are scrupulous about honoring curfew so we enjoyed fun but had quiet nights. The kitchen was well appointed as were bathrooms.